The 10th Edition of the International Images Film Festival for Women (18-26 November) in Harare, Zimbabwe brimmed with events, offering a memorable occasion for all who were present at the screenings, receptions, initiatives, master class, and award ceremonies, and who seized the exciting opportunity to network with local and international attendees. The international character of the festival was evident as representatives from embassies, NGOs and international organisations interacted with Zimbabwean counterparts and invited guests. Networking opportunities also included encounters with African film festival organizers Hans-Christian Mahnke of the Namibian Film Festival, Shamek Stepien of AfryKamera African Film Festival Poland, Lizelle Bisschoff of Africa in Motion Film Festival in Edinburgh, actor and filmmaker Martha Fergusson of Canada and Beti Ellerson, director of the Centre for the Study and Research of African Women in Cinema based in the United States, and Zimbabwean filmmaking professionals and cultural producers such as Jackie Cahi, Nakai Matema, as well as Michelle Ajida, Tawanda Gunda, Melody Gwenyambira, Blessing Hungwe, Upenyu Makoni-Muchemwa, Victoria Mtomba, and Tawanda Mukurunge, who also served as jury members. The festival theme “Women with Goals” was omnipresent; as films, organized activities and initiatives highlighted how women have persevered to attain the goals they set for themselves. Institute of Creative Art for Progress in Africa Trust Board Member Sarah Moyo reiterated these objectives in her presentation at the opening ceremony. The celebratory event which kicked off with the music of Mafriq, featured His Excellency Ambassador Anders Liden of Sweden, a major sponsor of the Festival. The diverse collection of films by and about women spanned the globe, from the countries of Belgium, Canada, Cuba, Czech, Egypt, France, Germany, India, Iran, Italy, Japan, Kenya, Mozambique, Namibia, Netherlands, Norway, Poland, South Africa, Spain, Sweden, Switzerland, Uganda, UK, USA, Zambia, and Zimbabwe. The myriad, multi-layered and wide-raging stories explore adolescent friendships; the bond between mother and daughter; traditional roles of sexuality and marriage; women struggling with depression, loneliness, jealousy and domestic abuse; the challenges of tradition versus modernity; the trauma of death; dialogues between past and present; generational conflicts within immigrant families; and the complexities within female relationships. The Zimbabwean films, screened at the popular Mannenberg (Harare) drew packed audiences, as local productions are increasingly in demand among viewers who are keen to see familiar faces and places. A new initiative of the festival is the Binga Outreach which will take place from 5-7 December where local films will be screened to audiences in the Matabeleland North town of Binga. 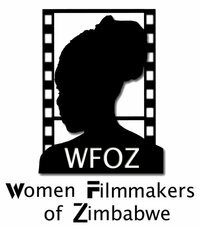 Women Filmmakers of Zimbabwe (WFOZ) in partnership with the UNWomen Gender Support Programme (UNIFEM) hosted the Ndichirimupenyu Awards. Now in its 6th year, the award honours women who have excelled in their various endeavours—including the categories art, business, sport and national social contributor. In 2010 the category Best Male Against Gender-based Violence was included to highlight the role of men as active players in the fight against gender-based violence. The African Fathers Initiative of Zimbabwe was very visible at the awards event. Similarly, the "New Man" section of the Festival introduced screenings of films that highlighted a new consciousness of what it takes to fulfil the role of a responsible, caring and loving “New Man” in African societies. Other highlights of the festival were the Master Class, the World Premiere of Nyaminymi and the Evil Eggs and the Distinguished Woman of African Cinema Award. Presented by UK-based Lizelle Bisschoff from South Africa, the Master Class entitled "Women in African Cinema: Questions of Absence and Presence", was the subject of her recent doctoral thesis. The World Premiere of the film Nyaminymi and the Evil Eggs by Tsitsi Dangarembga included the presentation of the Artists Charter for Zimbabwe, the screening, and a lively discussion with the filmmaker, producers and audience. Three women were nominated for the Distinguished Woman in African Cinema Award: Producer Jackie Cahi of Zimbabwe, Producer Bridget Pickering of Namibia and African Cinema Scholar and Centre Director Beti Ellerson of the United States. Beti Ellerson was awarded the prize for her important contribution to the advancement of African women in cinema. 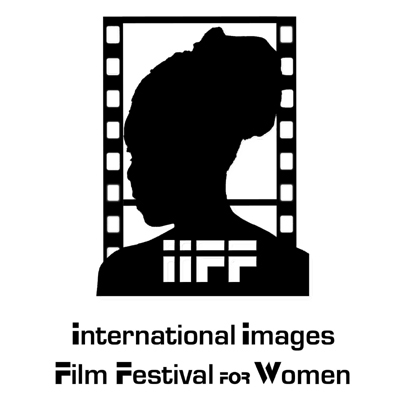 The International Images Film Festival for Women concluded with a farewell by Tsitsi Dangarembga, founder and outgoing director of IIFF, and at its 10-year anniversary, a passing of the baton to Yvonne Jila as she takes the reigns as new director. Rungano Nyoni from Zambia, has been crisscrossing the globe to festival screenings of her film Mwansa the Great since its release this year. The film evolved from the 2009 Focus Features' Africa First Program for which her film project was chosen along with four other African filmmakers to receive financial and professional support to make their short films. The film tells the story of eight year old Mwansa who aspires to be a hero and embarks upon a journey to prove his greatness - with unexpected consequences. Rungano Nyoni, who grew up writing stories, wanted to show the normality and fulfilled dreams of childhood despite adversity. Kenyan-German Philippa Ndisi-Herrmann explores how her multiple identities and complexity of experiences inform and influence her work. You are of Kenyan and German parentage and have lived and traveled in Europe and Africa. How have these experiences influenced you and your work? I will start by saying I am glad I have seen what I have seen, and that I have been where I have been. It has molded me to who I am. It’s been a long experience and it is still ongoing. For the longest time I battled with being one or the other – and in every location, every place, I am viewed as being other. Sometimes this becomes tiring – during the years I lived in Cape Town – this was harrowing – how others viewed me was incorrect to my vision of myself. However in hindsight this catalyzed my own revision of my vision of myself. Now I believe I am many things – I cannot be one thing – and I do not have to subscribe to one thing. What I am is my spirit, what I am, is my experiences. Being half white and half black, being half African, and half European, and having the perspectives of a German father and a Kenyan mother means that I see two sides to everything – I can put myself in the shoes of two polar perspectives which is advantageous to my filmmaking, especially the films I want to make. This juxtaposition, this contrast was once a battle within me. However now it means that in my work I am drawn to writing stories about people that are misunderstood in their communities. I am also drawn to writing stories whose objectivity comes from their subjectivity of each character. I live in Kenya, and I love Kenya. Kenya is my country – but strangely, and unfortunately I am viewed as an outsider. I do not mind too much, as I have come to terms with myself and who I am, and I believe I am Kenyan. I know I am Kenyan in my heart, and so one’s opinion of what I am is no longer important. I am often asked, in my own country, where I am from. This can hurt sometimes. Personally, I would say I am my experiences, and I would say I am Kenyan, I am, a black woman and I am an African – this is where my heart belongs. I grew up in a multicultural community in Kenya. So I grew up in a dynamic environment where one's cultural or racial identity was something to be proud of, whilst simultaneously not being an issue at all. In addition I grew up in the “leafy suburbs” of Nairobi – we grew up protected and educated in a British school system, I learnt Latin. So couple the leafy suburbs with a black white combo and I was an outsider in other people’s eyes. But many people were like me – so my background was not too much of an issue. Only when I went to school in Europe did I get a shock – I was young and sensitive. Suddenly I became aware of the difference between how I viewed myself and how others saw me. You work with both the still and moving image. Your photography is very cinematographic, not in the sense of a constructed image, but rather that it has a strong narrative character. What is your filmmaking in relationship to your photography? I have always been heavily attached to visual art through drawing and painting. I am very interested in images and so it was almost natural course to go into an art, that I believed had a “lifelike” embodiment. I chose to go into filmmaking and a bit later I took up photography as a hobby. I practice both – and I find that each honors the other. In addition through practicing as a photographer I enhance my own visual lexicon, deepen my aesthetic understanding and refine what images speak to me, and through this I know what images I want to speak to others. My penchant for photography is in its beauty to embody memory – a memory that is either real or “imagined.” I also like that, at least for the photography that I like, and that I take – I like that photography honors people. This is beautiful – you immortalize a soul, a whole lineage, a whole moment, a whole feeling in one image. That is beautiful to me. With a lot of my personal photography, the photography I do for myself; I want my images to look like a memory and carry the sentiments of a memory – a memory that the viewer relates to whether it is real or constructed. In this way some of images that I have captured, or lets say, some “evocative memories”, are what influence my filmmaking. Sometimes I am driven to write a story based on a photograph I took, a photography that maybe reminded me of a life I have never had. Some other times I will take a photograph and by chance, it is a images that belongs to a character I am writing about. It will look and feel like a photograph that was taken from the life of Sheba, the protagonist of Two Princes. Your film, Gubi - The Birth of Fruit is an experimental folktale, recounted solely with beautiful images and sounds of the drum. What inspired this work? Were you influenced by African storytelling while growing up? I wanted to write a story that took place in another time. And so, though I must say that African storytelling did not feature in my childhood, I am moved by it. For Gubi, I chose to create my own myth. Actually I wrote some prose based on my feeling for the film – and the prose spoke of seeds and burying seeds so that one’s spirit be reborn, and in turn return. And so with this, I started writing on the concept. I worked together with two other writers and Gubi – The Birth of Fruit is what we came up with. The drum in the film was surely a blessing – we had toyed with different sounds and songs – and they didn’t work – they were almost too much from this world. I went to a friend’s house who saw the rough cut, and Chris said, “Speak to Kesivan – maybe he can do something for you.” Kesivan Naidoo at the time was an upcoming South African drummer (now he is very established). So I called Kesivan and he came into the studio with a njembe – and we filled a metal thermos with some rice and soil and stones – and in an hour, Kesivan had performed the music for the film. I like the drum a lot in this film. A lot - because I see the drum as being the omniscient immortal character; the narrator of this love story. At the time I was interested in writing stories that had female martyrs – marginalized people that myopic people found easy to ostracize, however through their sacrifice they brought a great evolutionary change in their community. Which is what mythology is mostly about – African mythologies are like small vignettes of how we got where we are now; how our community got to where they are today. And so my narrative, through the protagonist Nok is about how the Gubi community discovered the circle of life, how we as humans became self-sufficient through learning that seeds reap fruit when buried. That is how I saw it in my mind. Your documentary, I'm Not Dead Yet (2009), is about anti-apartheid, resistance artist Manfred Zylla. How did you develop an interest in him and his work? Manfred the protagonist is a man that I really love. We no longer live in the same country and I must say I miss him. He is a close friend. I made the film about Manfred because I found him fascinating and in many ways I was curious about his life. Here is a man, a white man in South Africa – that during Apartheid chose to fight against the system instead of letting it work for him. He took on a problem, that he didn’t need to. I find this admirable. But then of course, in this post-apartheid era he is not recognized for his contribution because he does not fit into the box. So I made the film to honour his contribution and his work. In addition, as we began to know each other I began to ask myself more questions. If one’s art is not recognized or appreciated, is it worth doing? In addition – Manfred is a man who dedicated his life to pursuing his art – and now 2 divorces and 2 children later – I wonder is he happy. As an artist, and I am sure many people can relate to this – you wonder if what you are doing is right, or you hold the perception that following your passion will inevitably make you happy. But what if it doesn’t? And what if you sacrifice people you love for your art, what then? I don’t know – So those are some questions that I was curious about that spurred me to make a film about Manfred. I wanted to begin some sort of deliberation towards the “truth”. Your company, Thirsty Fish, an interesting name, what is its meaning? One of my favorite poems is “A Thirsty Fish” by Rumi. I chose this name for my company and I embraced it as a pseudonym for many reasons – for example, one of my favorite lines is, “a great silence overcomes me and I wonder why I ever thought to use language.” Sometimes there are feelings and moments that I cannot express in words. There are other lines in the poem that I like – that move me. The poem has been with me for a long time too, so it has a lot of memories and feelings that I attach to it. I like the voice of this poem because he or she believes there is so much in store for them. I like that. The words of that poem really move me. Rumi moves me. Your work in progress, “Two Princes” is a feature film. What is it about and when do you anticipate completion? To be frank, “Two Princes” is a film that I look forward to watching. It is about love, it is about death, it is about grief and it is about regret. I wrote the narrative because I was overwhelmed with a large bountiful landscape of moving pain in my heart and I knew I needed to write. This was coupled with my curiosity – I had so many questions that I wondered about. In my patriarchal society, what it is like for a woman to return to her husband, after she had left him for another man? Do we judge a woman’s infidelity and “wantonness” more harshly than we would a man’s? In Kenya, our strong Christian, Evangelical majority condemns infidelity, however it is socially accepted for men to have multiple partners and to openly partake in infidelity. A woman accepts that her partner or spouse has other women. These liberties are not extended to women. For women, there is an invisible line between when expression of their own sexuality is a freedom or a form of repression. There seems to be an overarching desire to possess a woman’s sexuality, and if a man fails to possess it, then an undercurrent of contempt brews. In “Two Princes,” the central idea is ownership. I believe there are some things we can and other things we cannot own. 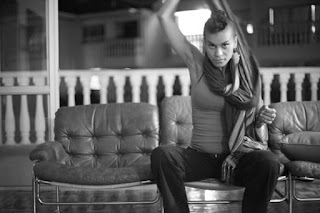 We own our self; our body, our thoughts, our pain, our honor, our sexuality. However we must justifiably take responsibility of our actions. We cannot own others; our husbands, our wives, our lovers, our children. Our cars, our houses, our land; they can never be truly ours, yet we are fixated on acquiring or keeping them. In Kenya; the desire to own is a common denominator. If we cannot legally acquire land, then we steal it. In the history of Kenya, and many other nations, this desire to own has brought conflict and destruction. My narrative unfolds in Lamu. This Islamic, Creole island embodies the conflict of ownership. Gentrification and animosity are surging. Plans are underway to build “Africa’s largest port. ” I ask, perhaps too naively, why do wealthy foreigners, and the Kenyan and Chinese Government have more say over this land than the people who were born there? Whose land is it anyway? How do we define ownership, and why? These are questions I ask myself, and you see I don’t know the answers, but I engaged myself on this journey to put myself there, and to get one step closer to the truth. In this phase of my life, I believe we all have our life journeys and we all have to live them – and we can’t stop others from living their life, and in turn we should have the freedom to live ours. I believe as long as we know why we do something, and as long as it is in line with our life journey, and we know why we embark on a certain voyage, and the implications of such a voyage – and if it does not harm somebody - then do it. I believe this – but sometimes I doubt my belief - what happens to the people you leave behind? What if the damage is irreparable? What if you regret it? I don’t know. I don’t know this answer. But I want to find out. I like “Two Princes” for many reasons – it is a film I need to make in order to let go of certain things I hold onto. It will be very cathartic for me. I find it to be such a hard and taking story to write and revisit. I find the story heavy. But it is an extension of me. This story needs to be made. This story needs to be told. I am also enthusiastic about the contribution that the film will make, certainly to Kenyan and African cinema. The film is slow – its personal and moody but very loving. I would like to finish “Two Princes” by the end of next year 2012 – or latest early 2013. Wanjiru Njendu from Kenya and currently based in Los Angeles, is a member of Women in Film, founder of A Magic Works Production and has just completed the film Look Again, about two women's struggle to come to terms with the aftermath of an accident. Wanjiru, what were your experiences with cinema while growing up in Kenya and what brought you to California, a hub of the U.S. film industry? As a child I was very fortunate to have parents who had a love of reading and cinema and always tried to create opportunities for us to be exposed to both. Video rental stores were a business growing up in Mombasa and I remember rushing to the store after school on a Friday to get the movies for the weekend. Every movie on that tiny grainy screen was truly magical and I was captured at a very young age by Steven Spielberg movies such as E.T which, made me want to become a director. E.T was one of the most magical films in terms of fantasy but had the family values at the very core of the film. I did my undergraduate studies at United States International University (USIU) now called Alliant and graduated with a degree in Psychology. After a year of working, I decided to follow my dream and passion and enrolled at Emerson College in Boston. Emerson is a small campus and really focuses on the students enabling them to work on productions with the professionalism of the industry. 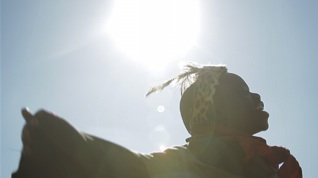 Your thesis film, Safari Ya Jamhuri: A Journey to Freedom, is a documentary about the Mau Mau, what inspired you to focus on this very iconic movement in the history of Kenyan independence? My parents and grandparents always placed an emphasis on our history and heritage as a family and two or three times a year we travelled to visit my grandparents. Some of my earliest memories were stories told about my paternal grandparents and my father in a camp with other Kikuyus held captive by the British. It always amazed me that even though my father was such a young child at the time, the experience really had an impact on him and the memories he has are so clear that it made me want to know more and once I began researching it really stuck. It is amazing how much the British colonialists got away with at time especially when they were working with other nations against Nazi Germany as it was the Second World War. 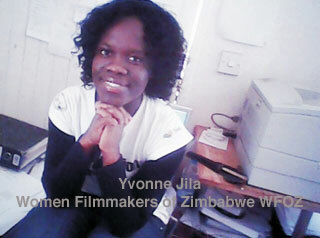 You are a member of Women in Film-Los Angeles and have done outreach to include African women. 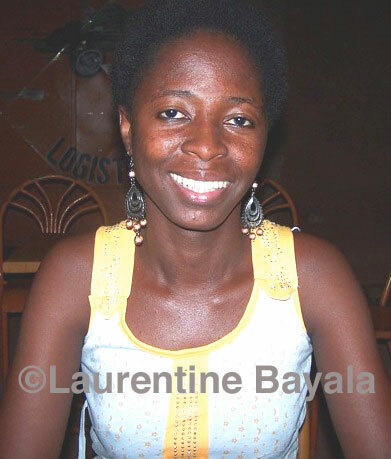 What benefits will African women in cinema receive as members of this organization? Women In Film is an incredible source for all women: of any ages, ethnicity and nationality. It is part of WIFTI which is the governing body. There are 38 chapters around the world with a newly formed chapter in Kenya. WIF creates an environment for networking opportunities and I have gotten jobs and met people I wanted to work with through them. The opportunities that Women In Film create include but are not limited to: master classes with seasoned industry players providing advice to their members, workshops where members participate, speaker series and best of all a mentoring program, through which I got to my mentoring in directing from acclaimed director Jon Amiel. Being able to have conversations with a director of his caliber opened up my eyes to so many things that you are not taught in college and these conversations have also altered how I work as a director and my casts and crew are much more appreciative of how I work as a director. The chapters are very supportive of each other and you can be a visiting member of a chapter if you are in the area for up to three months, which allows for dialogue and interaction and above all, networking and collaboration opportunities. In March 2011 you produced the Out of Africa: A Night of Kenyan Film and Culture at the Women In Film International Series, what inspired you to produce the series and what filmmakers and films were included? One of the committees I belong to in Women In Film is their International Committee; their signature event is the Women In Film International Shorts Program, which was in its 5th year. The Program is a celebration of filmmakers from all corners of the world, produced by the members of the Women In Film International Committee. I had volunteered as an associate producer in the previous two years, which featured a night of Palestinian, Israeli and Korean film. The series is different from short film festivals because they are a celebration of the culture of the selected country. There is a pre-reception featuring food; music and art from the culture and the guests are immersed into the culture for that evening. The international committee members select a country each year and for the 2011 series I suggested Kenya. Kenyan film is growing in leaps and bounds and this was an opportunity for it to be showcased as well as for me to produce a series. When I was looking at venues and pitching the series (one of the duties as a producer is to get the venue donated). I made a list of venues and Universal Studios appealed to me the most as they were the studio that made "Out of Africa" with Meryl Streep and Robert Redford and I wanted to make that the series theme, "Out of Africa: A Night of Kenyan Film and Culture.” I approached Universal and by some amazing luck, the executive Jennifer Fitzgerald was a fan of Ayub Ogada and immediately came on board. Universal was incredible in their support of the series, enabling me to turn the event into a full-fledged production where we converted the soundstage into a Kenyan-themed space for the night. Your production company, A Magic Works Production, what is its mission? Some of its projects? It is an umbrella for developing strong stories of all kinds, but above all, a place to focus on development on strong thematically themed African stories. I produced and directed Safari ya Jamhuri under its umbrella and I am currently development two Kenyan-themed stories- a feature, which I wrote based on the story of Lwanda Magere, and the other is a TV pilot. Your latest work, Look Again, what has been its trajectory, from conception, to fundraising, to production and now promoting it? Look Again was written by Kenyan writer Carole Keingati and my Director of Photography Andrew Mungai, also Kenyan, is a recent graduate of the American Film Institute. Look Again was made with a very unorthodox business plan. We started fundraising for the film in March 2011 on Indiegogo.com and we only raised one third of the production budget. At the end of May we decided to try a different approach. I contacted the vendors and asked them to supply us with what we needed at half cost and to defer payment until the beginning of August. What was the plan at the time? To enable to filming, while continuing to raise the rest of the budget to finish the film on Kickstarter.com., an all or nothing funding platform. By providing behind the scenes of what we were doing, it encouraged people to give to the project and a week after we wrapped production, we achieved our budget goal. Casting this film was terrifying for me as it was a very performance- driven story. It had a lot of subtlety in the story and I was very stressed during the casting process: sweaty palms and all (ha-ha). We saw a lot of actresses and actors and I am so humbled to say that when I saw the performances of Simone Cook and Lauren Neal, I knew I had found my leads. I then tested them together and their audition brought us all to tears. Look Again was shot over two consecutive weekends in July 2011, in Culver City and Encino in California. Fortunately our location manager got the locations donated to the film and all we had to provide was location insurance. With a fantastic and very talented cast and crew, this film is a labor of love come to life. We are currently doing the festival circuit. I feel like I live and breath this film. Every day I am thinking, which festival should we submit to? We have been so blessed as the film has already been accepted into four festivals on three continents, including the Kenya International Film Festival and in the United States in Los Angeles and New York City, and the African American Women in Cinema International Film festivals. 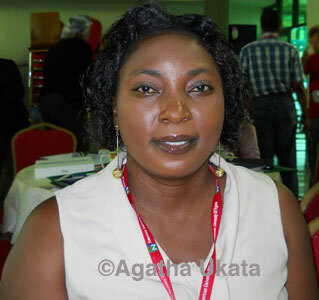 Laurentine Bayala, réalisatrice de documentaire du Burkina Faso, nous parle de ses recherches sur la réalisation documentaire de création, de l'émergence d'une culture du documentaire en Afrique, ainsi que de ses projets de films. Laurentine, votre recherche sur le cinéma documentaire en Afrique, "Cinéma documentaire du nord et du sud : quel types de coopération?" a été incluse dans le Groupe d'étude Cinéma du Réel Africain. Pouvez-vous nous donner vos réflexions à ce sujet? Je fais l’état des lieux de la coopération Nord-Sud dans le domaine du documentaire. Il ressort de cet état que le cinéma documentaire en Afrique est tributaire du financement du Nord. Le Sud apporte son soutien à ce genre, mais il est insuffisant. Afin de permettre l’expression artistique réelle des réalisateurs du sud, les Etats africains doivent davantage consacrer des fonds au soutien du documentaire de création. L'Université Gaston Berger de Saint-Louis du Sénégal est devenue un lieu important pour l'étude du cinéma documentaire, offrant le MASTER II en Réalisation Documentaire de Création. Vous y avez étudié aussi, quelles ont été vos expériences? Le programme comment est-il structuré? Le MASTER II en Réalisation Documentaire de Création est une filière professionnelle qui allie théorie et pratiques. Il est logé au sein de l’UFR (Unité de Formation et de Recherche) de Lettres et Sciences Humaines de l’Université Gaston Berger de Saint Louis depuis Octobre 2007 grâce à la coopération entre l’Université Gaston Berger pour le Sénégal et l’université Stendhal de Grenoble et Ardèche Images (AFRICADOC) pour la France. Ce MASTER accueille chaque année, 8 étudiants originaires d’Afrique francophone. Avec le MASTER II en Réalisation Documentaire de Création, j’ai appris à toucher à la chaine de fabrication du film allant de l’écriture, au tournage en passant par le montage. A la fin de la formation, j’ai pu réaliser un film d’école. Le MASTER II en Réalisation Documentaire de Création m’a permis de m’affronter pour la première fois à un exercice de pitch. J’ai défendu un projet de film en vue de trouver un coproducteur, à la rencontre internationale du documentaire de création organisée depuis 2002 à Saint Louis. AFRICADOC fait partie du programme, pourriez-vous en parler? Le programme AFRICADOC, développé en France par l’association Ardèche Images, mène différents types d’actions visant à créer un réseau humain dans les domaines de la formation, de la réalisation, de la production et de la diffusion des films documentaires de création africains. AFRICADOC organise tous les ans au Sénégal depuis 2002, les Rencontres « Tënk » qui est l’un des rendez-vous professionnel de la coproduction documentaire en Afrique. Ce programme a organisé des résidences d’écritures, puis a favorisé la production d’une cinquantaine de films documentaires à travers une dizaine de pays africains. 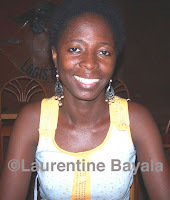 En 2010 Les Rencontres Sobatè ont été lancées au Burkina Faso. Lors de la cérémonie d'ouverture il y avait une reconnaissance des anciens du cinéma africain au Burkina. Comment ces aînés vous ont-t-ils influencée en tant que cinéaste? Les œuvres de mes ainés m’ont sans nul doute inspiré. Dans le temps, quand la télévision nationale programmait un film africain ou burkinabè, je ne le ratais pas. C’est avec les ainés, que j’ai découvert certains pans de la culture burkinabé. Ce qui m’a aidé à me forger une identité culturelle. Le Burkina Faso est depuis longtemps la "capitale" du cinéma africain, quel rôle a-t-il joué dans votre émergence dans le cinéma? J’ai été membre du ciné-club FESPACO. Depuis 2005, je participe à l’organisation du FESPACO dans les commissions TV-Vidéo et presse. C’est dans le ciné-club que le scénariste-réalisateur Guy Désiré Yaméogo m’a copté (avec deux autres amies) pour rédiger des critiques. Il nous a ensuite encadrer pour écrire un scénario qui a remporté un concours. C’est ainsi que j’ai réalisé mon premier court-métrage « Amour sans frontières », financé par une fondation espagnole en partenariat avec le FESPACO. Pour ainsi dire, mes premiers pas dans le cinéma ont été concrétisés grâce au FESPACO. Le Burkina Faso a une présence impressionnante de femmes dans le cinéma. J'ai eu l'occasion de rencontrer et de discuter avec plusieurs d'entre elles. Quelles sont vos impressions sur le rôle et la présence des femmes dans le cinéma burkinabè? Elles sont nombreuses, les femmes burkinabè qui ont fait du cinéma leur passion. Elles sont aussi présentes dans la chaîne de fabrication de l’image allant de la réalisation au montage en passant par la comédie. Je ne parlerai pas de rôle des femmes dans le cinéma burkinabè , mais je parlerai plutôt de leur apport. Les femmes burkinabé se sont appropriées la caméra pour apporter leur touche singulière, pour porter leur regard particulier sur le monde. Cela enrichit et diversifie leurs œuvres cinématographiques et c’est le cinéma burkinabè dans son ensemble qui gagne. 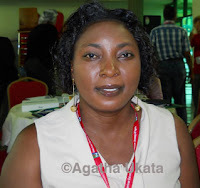 La première édition de journées cinématographiques de la femme africaine de l'image a été tenue à Ouagadougou en mars 2010, vous avez participé en tant que réalisatrice à l'événement. Quelles ont été vos impressions? Quels étaient les buts et objectifs de l'événement? Je trouve que c’est une belle initiative qui promeut doublement les œuvres des femmes. La première édition m’a permis de découvrir des films que je n’ai pas pu voir au FESPACO. C’est aussi l’occasion pour les femmes de mieux échanger sur les défis du cinéma. Ce festival vise à promouvoir le cinéma africain fait par les femmes. Pourriez-vous nous parler de vos films : Amour sans frontières, « Risquer sa peau », « Mon mal, un mâle » et leur réception? En dehors de « Amour sans frontières » que j’ai réalisé en 2007, les deux autres titres sont restés à l’état de projet, par manque de financement. Je continue de les réécrire et de les soumettre à des commissions. « Amour sans frontières » a participé à des festivals en Espagne, en France et au Burkina. Il est difficile pour moi d’évoquer le côté « réception », mais je dirai que la réalisation de ce film m’a donné envie de continuer à réaliser d’autres oeuvres. Taghreed Elsanhouri, of northern Sudanese origins, discusses her first three films, her Sudanese identity, and her latest work about the transmutation of Sudan into two nations. Taghreed, you were born in Sudan and moved to Britain with your parents as a young child. 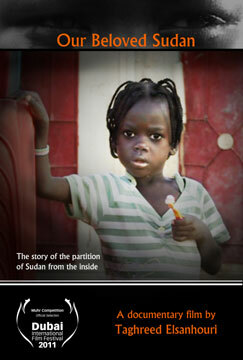 What does a Sudanese identity mean to you? Your experience as an Anglo-Sudanese, how does it inform your work? My Sudanese identity has meant different things to me at different stages in my life. I have, I think at various stages tried to deny it then to find it and reclaim it and finally now I think to be at peace with it. I think the tension about my Sudanese identity and what it means to me has been at the source of my creativity. Your three previous films, All about Darfur, Orphanage of Mygoma and Mother Unknown, reveal your exploration with Sudan and in many ways they were about your rediscovery of your country--of course Orphanage of Mygoma has been life changing. What were your experiences with the films and your journey while making them? I think through the journey of all three films I was still very much a guest of Sudanese culture and identity, treading carefully, cautiously not wanting to unintentionally offend, and seeking to please everyone. It is only now after living in Sudan for 3 years that I feel I have come to know my own voice and to feel comfortable and assertive in it. What has been the reception of these films? The international festival circuit received All About Darfur very warmly, I think the film’s inside perspective was new and refreshing. The film was also much praised in Africa where it won a prize at ZIFF (Zanzibar International Film Festival) and at the Kenyan film festival. In Africa in particular I think it was so much appreciated for the platform it gave for ordinary Sudanese voices to be heard. The film gave dignity and voice to a host of characters that we normally see spoken about by experts but that we never hear speaking in their own words. I am proud of making that film with a budget of no more than 20USD. Orphans of Mygoma was commissioned for Aljazeera Witness and I think apart from changing my life the film has had a positive impact here in Sudan where it has opened the debate regarding the social stigma facing illegitimate children and inspired many young people to fundraise for the Mygoma orphanage. Your latest film Our Beloved Sudan examines the history of a nation and its evolution into two countries, Sudan and South Sudan. What inspired you to make the film? What would you like the viewers to get from the film? While your origins are northern Sudanese, you are very attached to the South, your son Abdelsamih has origins there. What are your feelings about the separation of Sudan and to what extent does it mean a renegotiation of identity for you and the Sudanese Diaspora? Regarding the separation I feel we had enough time since independence in 1956 to figure out how to forge a unifying identity. We failed and the consequence has been partition. My concern is about whether we will have the maturity and the leadership to create two new stable nations or whether both new entities will become failed states with all the destructive fallout and suffering that such an outcome implies. While my origins are northern Sudanese I have been shaped by my experience as an ethnic minority in the UK. My empathy for the condition of Southerners and other marginalized people in Sudan comes from this minority consciousness. Having lived with racism as a Black British and experienced the undermining and destructive impact of racism first hand in my own life I am compelled to speak out when I see it in Sudan from my reversed vantage point here as member of the dominant group. Abdalsamih my son is ethnically from Darfur and I would like for him to have spiritual and cultural links to the place that he is racially from. Growing up in the UK I saw myself as a Black woman and intellectually and spiritually I have been shaped by the work of Black American women like Toni Morrison. African literature has also been crucial to forging my identity in Diaspora. Arabic however is my mother tongue and even though I am more fluent in English I feel my Arab and Muslim heritage is intrinsic to who I am as well. As a northern Sudanese I am racially both Arab and African and the two coexist side by side for me and are a source of cultural and creative wealth.